Continuing our collaboration with Quartz, we were thrilled at the opportunity to take things up a level for the sixth Next Billion Forum this past November. The event has grown and a larger venue was needed; hence we got a whole new space to play in, the beautiful Conrad Hotel in downtown Manhattan. We updated the onstage branding that we developed for London and New Delhi; however the most exciting opportunity was to create a custom loop that played throughout the day over the registration desk in the networking lounge. The goal was to enhance the guest experience for the flagship event, and specifically bring the energy of New York City to the brand. Based on our initial scouting of the Conrad in August, we determined that the space at the top of the stairs provided a perfect opportunity to greet guests with a lively visual element as they approach the registration desk upon arrival. As in London, the aim was to engage the viewers with “visual brain teasers” that were simultaneously elegant and a bit playful. Since this would not be playing in the main hall during presentations (as in London and New Delhi), we were freed to cut loose with a lot more energy. From the outset, Quartz design lead Eric Trott and I talked about using speed, angles, and bright pops of color to connect the brand to the energy of the city. We also wanted about 2 minutes before the content looped, corresponding to the maximum time it typically takes to check in an attendee. 2 minutes. Blank canvas. What on earth would we fill the screen with? After some brainstorming, some goofing around, some sketching and some starting over, we found the key points of inspiration. 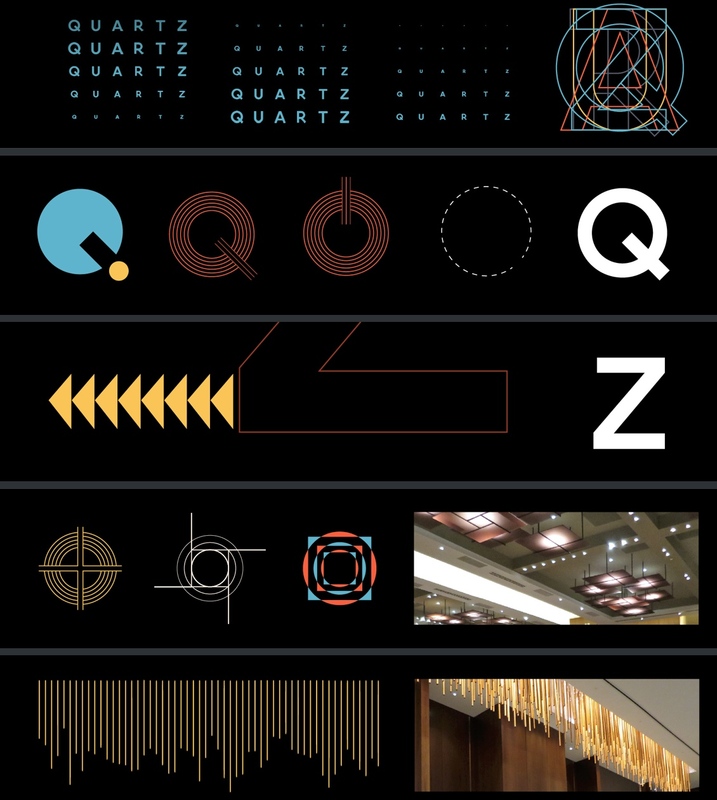 We’d juxtapose forms inspired by the architectural details of the space with shapes based on the Quartz logotype and Next Billion brand mark to ground the event in the space, and more broadly the brand in the city. We decided to include The Next Billion literally, extrapolating the number of internet users coming online leading up to event day. This idea, embraced in an initial design round, was expanded to include number of e-mails sent and smart phones purchased. The animation was a hit, showing up on social media posts, and more importantly contributing to the immersive experience of The Next Billion forum. We were lucky enough to attend an amazing day of inspiring content. You can watch the livestream of the event here. We love collaborating with the Quartz team and can’t wait to do it again.